I am pretty happy that Warner dumped He-Man. I grew up playing with the toys and watching the cartoon religiously and I don't want to see another crappy version of the character brought to the big screen. WB had Kung Fu Panda director John Stevenson attached to the picture, but now that it is over at Columbia, the film will start completely fresh. Those of you who may not know the lore of He-Man and the Masters of the Universe, it followed Prince Adam of Eternia, who was young warrior that when he utters the words "By the power of greyskull, I have the POWER" he would transform into He-Man (cue the music) along with his cowardly feline friend Cringer who became the ferorcious Battle-Cat. 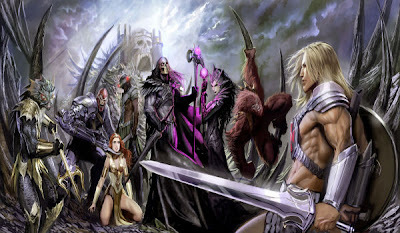 He-Man with the aid of his comrades Man-at-Arms, Meckaneck, Teela and Orco (among others)would fend off the evil forces of Skeletor.